As regular readers know, I am no expert on the obscure and arcane of the business of baseball. Nevertheless, when all these gazillionaires get together and decide the future of our sport we should give the deal a small amount of attention. The players and the owners did come to an agreement. For the obsessive, you can take a look at the summary of the agreement here. For commentary, try St. Pete Times, or Rays Index, or DRaysBay. For the larger picture, a couple of key points seem to some experts to be really important to baseball and ultimately the Durham Bulls. We'll have baseball without labor strife for a couple more years. They are at least trying to get a grip on the human growth hormone issue. How will the spending caps affect a young athlete's choice of sports? We'll see. With the signing deadline moved up, drafted players will start playing sooner and show up in Durham as much as a year earlier. But that's the big picture. What about the fine print? And what's up with that batting helmet? I've written about baseball's helmet policy before. 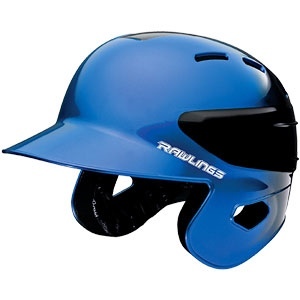 Basically, if you're a minor leaguer you have to wear the much more protective helmet shown above, but when you get to the big leagues you can wear something a bit prettier. The new agreement calls for the adoption of better helmets by 2013. I'm guessing that the delay has everything to do with studly looks. Can't find a photo of what the new helmet's supposed to look like. For National Leaguers going up against Aroldis Chapman next year, it may be a year too late. The parties agreed that no new players will be permitted to use a low density maple bat during the term of the agreement. Notice the words "new players". That would be players new to the major leagues. I'm guessing that means that maple bats will be taken out of the hands of minor leaguers immediately, but if you're a big leaguer you can keep on chunking pieces of your bat at the pitcher and the rest of the infield until you retire. Lastly, to the detriment of the game, the players and owners conspired to slow down the game even more. I kind of like instant replay, but I hate 4-hour ball games. This change to the instant replay policy is going to delay the game. The crotch-scratching batters and twitchy relievers are bad enough, now we'll wait for the umps to huddle around a TV set. Play Ball!!! Instant Replay will be expanded to include fair/foul and “trapped” ball plays, subject to the Office of the Commissioner’s discussions with the World Umpires Association. I wouldn't mind the replay if they made the system run a bit smoother. They need a "booth" the way the NFL has. Baseball replays should be quick (no need for the many different angles that the NFL uses). Most of the time wasted is all of the umps gathering up, walking off, then walking back. Have one guy in a booth who can make a quick look and radio down the call. Much quicker and less disruptive. Because most of my baseball time is spent at the DBAP, I don't watch too much ball during regular season. That means I see the worst of the excruciating delays that are a feature of the playoffs. Your ideas make all the sense in the world to me, although I'd be just as happy leaving things as they are. I forgot an item of the CBA that will affect the Bulls, 26 man rosters for double-headers. Will have to update.